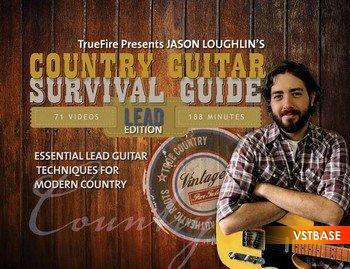 Whether you choose to borrow, convert or strengthen your existing country lead chops, Country Lead Guitar Survival Guide from Jason Loughlin will deliver the goods. Jason presents stellar instruction for developing 12 essential skills and techniques that are requisite to the style; Chicken Pickin', Pickin' Triads, Pickin' 3rds, Pickin' 6ths, Banjo Rolls, Open String Licks, Flat Picking, Double Stops, Bending 3rds, Bending 6ths, Pedal Steel Emulation and Lap Steel Guitar Voicings. Each of the 12 techniques is presented in its own chapter of video lessons. Each chapter includes two instrumental studies featuring that specific technique. The first instrumental study will expose you to the concept and focus on getting you comfortable with how the idea moves on the fretboard while helping you develop the right and/or left-hand techniques required to pull it off. The second instrumental study puts the pedal to the metal and demonstrates the different ways that the technique can be embellished with the left and right hand. Jason first performs the instrumental study and then breaks it down note-for-note, move-by-move. In the breakdowns, Jason reveals the mechanics of the technique, the concepts associated with it, and the underlying theory. All of the studies are demonstrated (and then practiced by you) over a diverse range of rhythm tracks. All of the teaching is presented in a musical context; no tedious exercises or drawn out explanations -- you will play your way through the Country Lead Guitar Survival Guide, and have a blast doing so!